Communities are growing and evolving, and with that, our transportation needs are changing. Now more than ever, we need smart solutions that provide safer, more reliable and cleaner transit. Every day, Proterra works to meet those needs, with the world’s best-performing zero-emission buses. Proterra’s revolutionary battery-electric buses help fleet operators abandon fossil fuels, improve environmental quality and reduce operating costs. 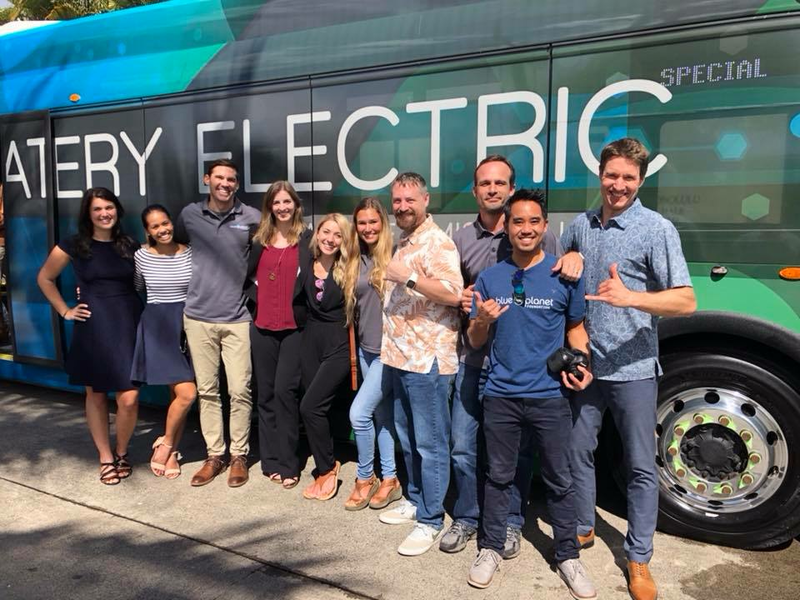 Recently, Proterra launched its first electric buses in Hawaii with JTB Hawaii, Inc., a provider of travel services in the Hawaiian Islands and Hawaii’s leader in offering tour vehicles that promote sustainability. With the three new electric buses, JTB Hawaii can avoid more than 8,250,000 lbs. of greenhouse gas emissions over the 12-year lifespan of the vehicles. Three full-size buses were unveiled at the blessing ceremony at the Travel Plaza Transportation Bus Facility in central Honolulu, where they will be stored and powered utilizing a dedicated charging station installed for that purpose. The buses will initially operate routes provided by JTB in Waikiki and downtown Honolulu, with service beginning in April. The new electric-powered buses will stand out for more than just their environmental benefits and energy efficiency. Each bus features a uniquely appealing and colorful exterior wrap design inspired by Hawaii children through Blue Planet Foundation’s “Driving Forward” Art Challenge program. Last year, Blue Planet Foundation encouraged children to share their views through art on what Hawaii’s 100 percent renewable transportation future will look like in 2045. More than 250 students from 14 schools statewide participated in the program, from which 42 pieces of art were selected to be displayed as part of the bus wrap design. Hawaii is the first U.S. state to adopt a 100 percent renewable energy portfolio standard. Led by Governor David Ige, Hawaii set its sights on becoming the nation’s first carbon neutral economy by 2045. Today, the state has the second-highest percentage of non-commercial hybrid or electric vehicles in the U.S., and Honolulu leads the country with the most per capita photovoltaic solar installations. Hawaii is particularly focused on reducing petroleum use in its transportation sector, which accounts for the highest percentage of petroleum use, according to the Hawaii State Energy Office.